Random comments from an entrepreneur in Florida. I thought it would be interesting to take a high level look at what the "economic impact" of a Tech Startup is on average. A lot of local economies are suffering because they either depend too much on tourism or real estate - or perhaps their core industries are dying (e.g. manufacturing, etc). Every local economy wants to diversify, but the big challenge is finding the best way to grow new businesses or convince other businesses to move to the area. Many times they shy away from "startups" because they are too risky, or don't present an immediate opportunity for hundreds or thousands of jobs - but in my opinion investing in startups is the best and ultimately the quickest way to creating the right kind of jobs, and boosting a local or State economy. Lets start with the micro-economics of an average Startup. Most tech startup acquire venture funding. On average I would say 80% or so raise around 500k to 1M in funding (even the bad ideas get money in the beginning). The other 20% usually go on to raise more money - up to 5M or more. In States with concentrated Venture Capital, these stats change quite a bit - but I am being conservative in my estimates because my experience is in Florida (which is not strong in later stage Venture Capital). So where does this money go? Well it goes to people, services, rent and marketing. And it is spent quickly. This is what makes a Startup an interesting catalyst for economic growth. Even though they don't have a lot of money in the bank - they spend it quickly (unlike larger more established companies). So for example. compare an established 10M revenue 'non-tech' company, and a startup that has 1M in the bank for growth. I would argue these two companies have a similar economic impact in non-payroll type investments - e.g. Marketing, Outsourced Services, etc. Ofcourse the 10M company has a bigger payroll, but they most likely are not spending a large of money locally in new development, marketing or other services. So the startup may spend 250k-500k in these services in the first year or two, while the more established company has reduced its "growth spending" and is simply trying to find ways to cut costs, and maintain profitability. So, then the natural discussion next is about jobs? Does a company with 30 employees (low-paid manufacturing, etc) have a bigger impact then a tech startup with 4 (high-paid employees)? Of course the amount of payroll is bigger with 30 employees - but my argument is that they make less of an impact, because they have less of an economic impact, because they are not spending outside the basic living expenses (house, food, clothing, etc). The higher paid employees are going out for dinner, buying big screen T.V.s and paying for dry cleaning. So although the non-tech established company is spending 100k per month on payroll, most of it is going to mortgages, groceries and gas. So by now, you should see my position clearly - Size doesn't matter - Spending does. POINT: Tech Startups and their employees' money has more impact on a local economy. Now, lets look at long term impact. Obviously, the Non-Tech company will start to face more competition, and their product margins will shrink, and ultimately they will either need to move most jobs overseas or downsize. So now, the 30M revenue company is spending much less in the local economy. On the flip side - the Tech Startups will continue to grow (and yes, a few will die - but not until they spent all their money). Those that do survive, will grow quickly and become 5-10M revenue companies, with 10 times the economic impact of the 30M non-tech company. So now you have a 10M revenue tech company - who needs to hire more high-paying jobs, and is spending more on local economic services - and ultimately will also spin off new companies as employees leave with their ideas and start new companies. Take any local economy that wants to grow, diversify and make a real investment in building a strong business community - I would argue that putting 50 Tech Startups in that city, versus trying to get 10 established "non-tech' companies each having 20-30M in revenue to move to the area is the better choice. At first glance, you would think its a no-brainer to choose the established companies. 50 Tech Startups = less than 100 jobs, no revenue versus 10 companies with 30M in revenue each = 300M in new revenue and probably 1,000 jobs. For me, I would take the 50 Tech Startups - anyday. Even if they all fail, the economic impact over the short term will be greater than the established companies - and all the "jobs lost" if they did fail, would be entrepreneurs that would turn-around and startup something else.... and the cycle would be never ending as long as the local community supported them. 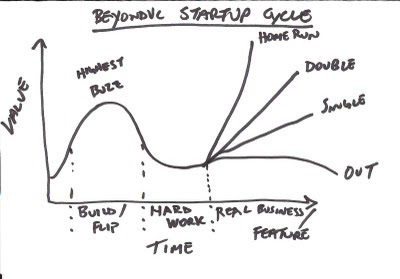 POINT: Failed Tech Startups does not mean jobs are lost - they just start something else and continue the cycle. What does it take for local community to build a Startup Community. Simple. Why "Bailouts" don't work - D.C. is not a V.C.